King Arthur: Legend of the Sword is the sort of wholly unremarkable film that I wouldn’t feel behooved at all to review if mainstream critics hadn’t designated it for lower repute than several Amy Schumer movies. Maybe the lot of them were simply reacting out of visceral fury, having been spoiled prematurely by Guardians of the Galaxy Vol. 2 and improperly readied for their first taste of what’s sure to be a nauseating summer. Maybe they just don’t like fantasy that has no overt political overtones or purpose other than to pass people’s time for two hours. The key to enjoying King Arthur is to enter it with no preconceived expectations of receiving a traditional Arthurian yarn, about chivalry or honor or humility or respecting women. It’s been a good seven years since I’ve delved into a book of Arthurian legend, the last of which probably being Tolkien’s Sir Gawain and the Green Knight, so I won’t pretend to be an expert on the movie’s background, but I can say that Guy Ritchie’s Arthur fits both visually and structurally into the well-worn superhero origin story template. 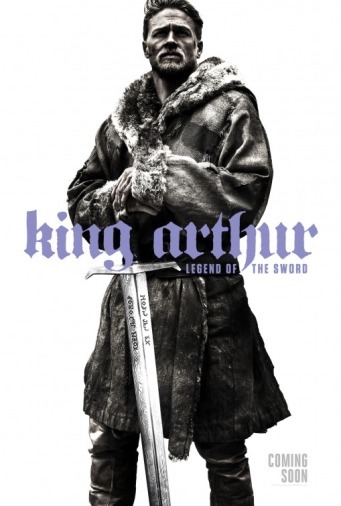 The movie traces the ascension to greatness of an unappreciated, invisible orphan of humble origins (raised in a brothel) who discovers some power vested in him alone (Excalibur) as a chosen one (rightful heir of Uther Pendragon), rejects said ability initially because he’s timid and lacks the will to power, rises to the occasion when his girl is taken captive, and vanquishes an evil overlord (Vortigen, his uncle) who has a personal connection unbeknownst to him. The hero also quips a lot and bears himself into every situation with a certain affected swagger. In other words, Legend of the Sword is a movie you’ve probably seen dozens of times before in different drapes, but I wouldn’t necessarily hold its unoriginality against it. Yasujiro Ozu recycled the same actors, shot setups, and generational conflicts over and over again throughout his robust filmography, but he’s still counted amongst the greatest filmmakers, so familiarity isn’t damnable in and of itself. What hampers Ritchie’s Arthur from attaining anything more than mediocrity is its scattershot pacing and stylistic dissonance, arising mostly from the need to be a commercially viable, PG-13 movie. The movie’s hook immediately accorded me many reasons to second-guess how I was spending my Saturday evening. King Arthur fades in to a wide shot of a flaming Sauron eyeball tower, then fades to black right after that with no exposition or characters introduced. I don’t recall if there’s a text card after that, but the next thing that we hear is the bellow of a giant Oliphant, and it quickly becomes apparent how little computer graphics have advanced since Return of the King. An incoherent battle on a bridge ensues, then segues into some lazy, wannabe timely world-building that emphasizes a rift between prejudiced normals in Camelot and downtrodden others, the mages, a beautiful and peaceful people who have been deported back to Africa on account of the unrepresentative extremist Mordred. Certain Arthur purists may raise their noses at the gigantic war elephants in the opening sequence, but within Warner Brothers’ socially conscious revitalizing, they actually make a potent metaphor for homegrown terrorists traveling vast distances from their natural habitat to wreak righteous havoc on the West. Not that that has anything to do with the rest of King Arthur, which is one of many foibles with the opening besides pretentious slow-motion, lack of context, some truly terrible font, and the pointless casting of Eric Bana. Maybe future entries in the now-doomed franchise would have focused more on Us. Vs. Them sermonizing, but this is more of a personal vengeance tale. Having brushed all this obligatory trailer footage out of the way, Ritchie finally gets to his hero and the film starts to develop into something halfway interesting. The movie blazes through Arthur’s hardening childhood in a montage full of slam zooms and precisely timed cuts that serves the threefold purpose of waking up audiences, mirroring Arthur’s dexterity in thieving, and showing off Ritchie’s skill at packing much longer scenes into a concise and entertaining form. A lot of early apologists for King Arthur have erroneously complimented its dialogue for being “witty”, but it’s really not. For one thing, none of the vocabulary rises above a 5th-grade reading level, and I may have inwardly groaned when Jude Law shouted at his minion, “Do your f___ing job!” The dialogue is, however, briskly edited, and Richie uses tons of L-cuts to hasten along scenes where not much is happening. The cross-cutting doesn’t always work, mainly in the ending, which mindlessly interweaves two scenes happening in the same room under the same lighting with the same set of actors. On the whole, though, King Arthur poses a workable solution to the exposition problem that’s endemic to a lot of its contemporaries. Some have labeled Richie’s twitchy directing style as formulaic or annoying, but I’d rather watch someone try to entertain me than someone bite the bullet and willingly put out an exposition dump that’s proven antithetical to cinema time and time again. Special credit must also be given to Daniel Pemberton, who has composed yet another unique and energetic score after gracing The Man From U.N.C.L.E. (a more satisfying movie overall). From what I’ve gathered, mainstream critics don’t pay nearly enough lip service to the role that music plays in motion pictures, which contributes to a cyclical pattern of mainstream action entertainment coasting by on extremely bland and homogeneous soundtracks. Even Guardians of the Galaxy Vol. 2, which I otherwise enjoyed, blatantly riffs on a Fury Road theme in the first five minutes, and Fury Road itself wasn’t that original in the music department. So whenever someone like Pemberton breaks through the mold of sameness and mediocrity, I feel both overjoyed and irritated, knowing the accomplishment will mostly go overlooked. If King Arthur’s score invites comparison with anything, it might be with Inception, but this is still a singularly medieval piece of work that tinkers with metallic clinking noises, elephantine rumbles, and even human hyperventilating. In spite of its unimaginative title, most of King Arthur revolves around a meek and immature outcast who hasn’t yet grown into his social vocation. The crux of Arthur’s development is his struggle to endure a particularly scarring vision of his father’s demise, which is filtered to him through physical contact with Excalibur. The movie wisely doesn’t peddle any hackneyed message that the leader of a nation can come from anywhere; in fact, it kind of says the opposite, making the strongest case for merit-based monarchy since The Lion King. In this Arthurian world, one is born to power and has a duty to accept that charge. The nameless enchantress who can enlarge and speak to animals (and doesn’t do much else) succinctly spells out the movie’s theme when scolding the squeamish and whiny king for averting his eyes from the past. “I look away. We all look away. But that is the difference between a man and a king.” Color me surprised that so many critics despised this in the current day and age, when many people seem eager to look away from the uglier aspects of history, when politicians recoil from “crude and disgusting Youtube videos”, or the public from live-streamed violence, when the president himself refuses to release a “graphic” picture of a deceased terrorist who murdered thousands of innocent people, or even to call him an Islamic terrorist. If only Warner Bros. had the kingly mettle not to look away any time someone in the film dies by the sword, which happens a lot. This is a film in which multiple throats are slit off-camera, in which the main antagonist stabs and sacrifices his wives to a hideous tentacle monster for a momentary rush of power, and Ritchie paints this ruthlessness in the most blunted and bloodless of strokes. Despite the epidemic of poorly-reasoned, leftist articles complaining about unrestricted movies having “more gun violence” than restricted movies, the PG-13 label has truly been regressing into kids’ territory ever since Marvel movies became the standard-bearer for the category, to the point that studios no longer dare to depict violence either accurately or impressionistically. I don’t need every movie revolving around war or swordplay to resemble Hacksaw Ridge or 300, but when the company behind Suicide Squad and the Hobbit trilogy repeatedly waters its films down with the aim of maximizing profits, it has the cumulative effect of limiting what future art can show under that rating. This video handily traces the rating’s decline by the example of Gremlins, Titanic, and a bunch of 80’s remakes, but I’d also point to The Lord of the Rings and Peter Jackson’s King Kong, both of which secured a PG-13 while showing decapitated heads being lobbed over a wall and adventurers being devoured by giant leeches. In King Arthur: Legend of the Sword, Arthur fights a misty, nondescript, CG boss and is lectured against turning a blind eye to suffering, and yet the movie does just that, over and over again. There’s a smorgasbord of issues I haven’t even touched on: forced racial diversity in a place where it doesn’t make sense, an unfulfilled romantic subplot, discreetly photographed mermaids, a 15-minute portion in the middle that does basically nothing, and just how terrible some of the action is. I’d tell Warner to get their act together for the sequel, but that probably won’t be necessary after all, since this has currently made back around $134 million of its $175M budget before advertising. In other news, the CG remake of Beauty and the Beast has become the 8th highest-grossing film of all time in the States (not adjusted for inflation), just ahead of Finding Dory and just behind Rogue One. Thanks, America!